We woke up to our first rain in the morning. The weather forecasters were promising brighter spells later in the day, but to start off we needed to don our raingear and head out the door regardless. Again, we took a slightly different route than the Ridgeway for a short while in the morning, joining the trail a little north of the village. Again, this meant some road walking but this time on a busier A road in the rain. The cars whipped by the narrow grass verges where we stood for some protection, and I was glad to reach the Ridgeway trail again after about a mile. The weather started to brighten and we saw the sun start to come out. 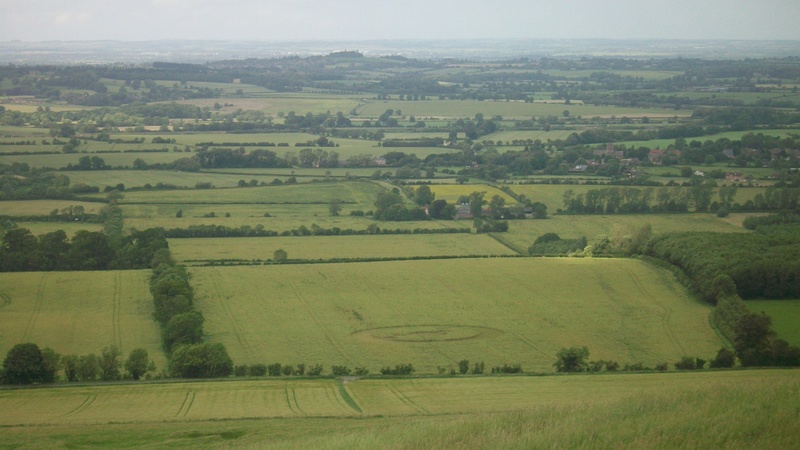 Our walk today was 12 miles with two highlights: Waylands Smithy, another ancient long barrow, and the White Horse of Uffington, an ancient hill carving. Horses were an important theme of this trip. Race horses feature prominently in the area. 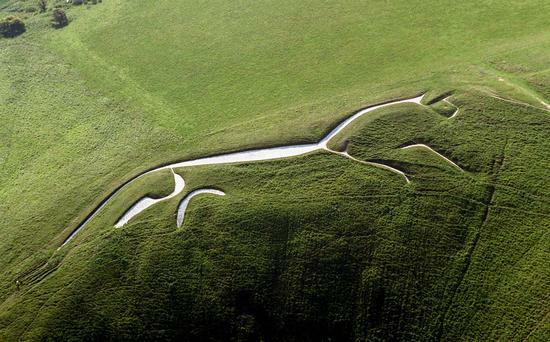 Grassy circuits called “horse gallops” appeared alongside the trail regularly. We hoped to catch a glimpse of them in training, but with no luck. I think we were always too late in the day. 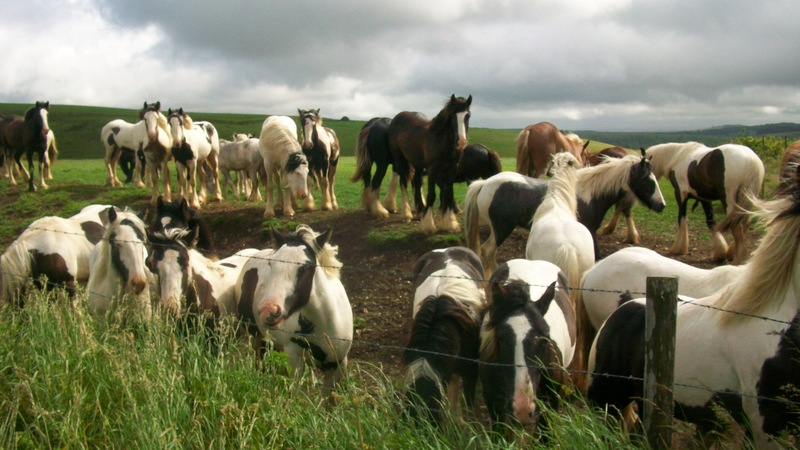 However, we did see them grazing in the fields, and being ridden around on the many bridleways that crossed our path. 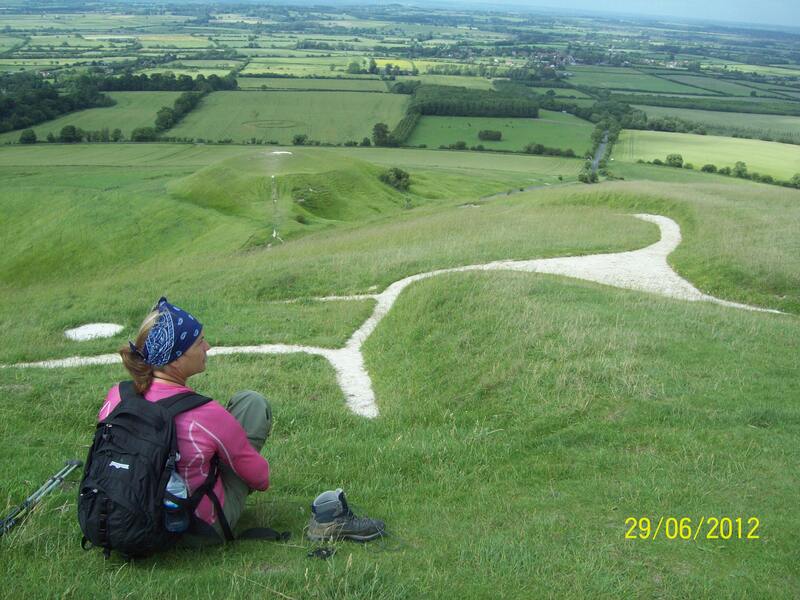 And of course, there was the horse, the White Horse of Uffington, waiting to greet us at the end of the trail. 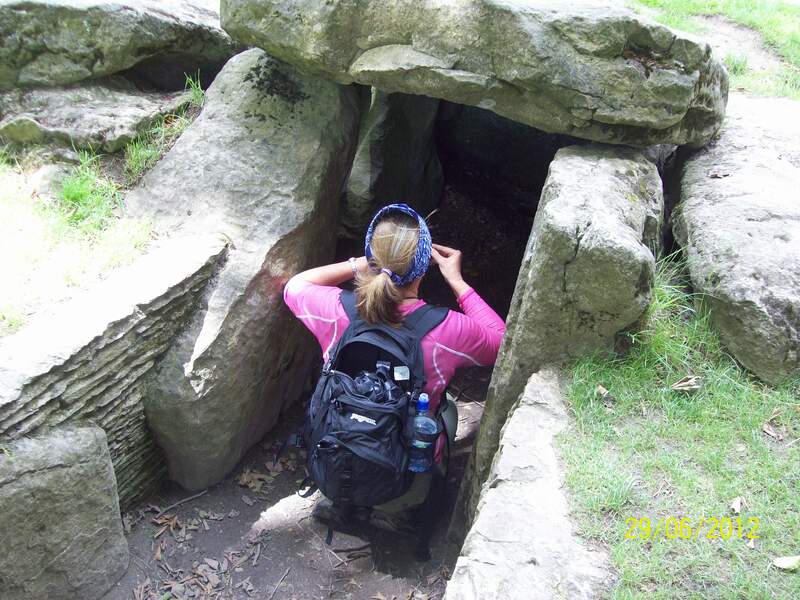 An explanation of the day wouldn’t be complete without a more detailed mention of Wayland’s Smithy, another extraordinary long barrow tucked away down a country lane. Unlike the West Kennett Long Barrow we visited a couple of days earlier, we arrived in the afternoon as the sun made a re-appearance and everything seemed so much less spooky. In fact, Nikki managed to get a signal on her phone, and while she caught up on texts, I lay in the damp grass and closed my eyes. I even managed to get a power nap. We stayed at least half an hour in that quiet, hidden place until other visitors showed up and the spell was broken. 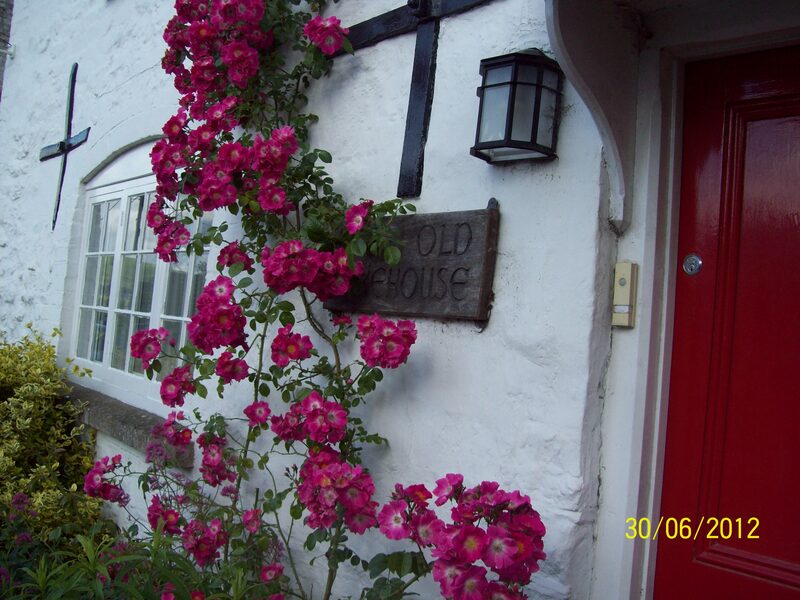 We spent the night at Norton House in Uffington Village, after about 1.5 miles of road walking to end our day. A sore finish for the knees was starting to be a regular occurance. Uffington Village is in Oxfordshire, somewhere today we crossed the border into the next county, and very pretty it is too. 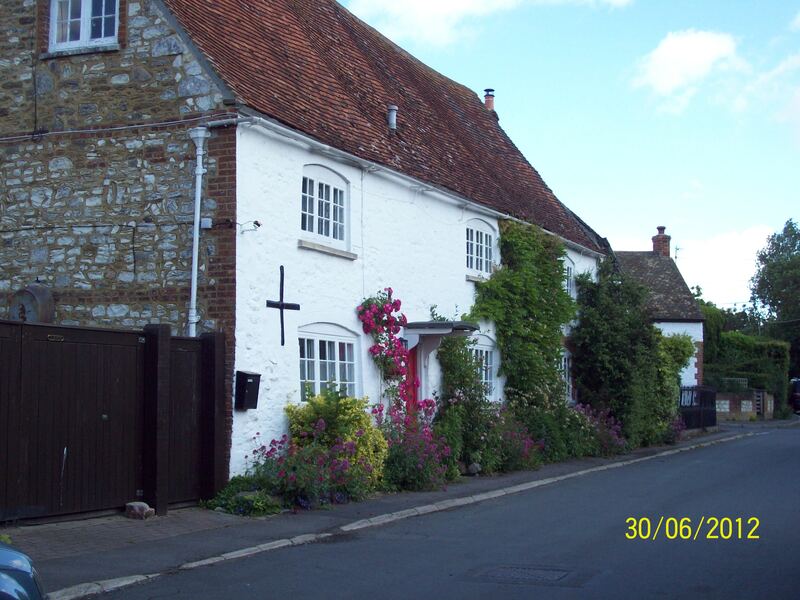 There were lots of chocolate box thatched cottages and pretty English country gardens. We had a pretty good dinner in The Fox and Hounds, except for the gritty side salad which really let them down. A shorter day tomorrow – only six miles – almost a day off! 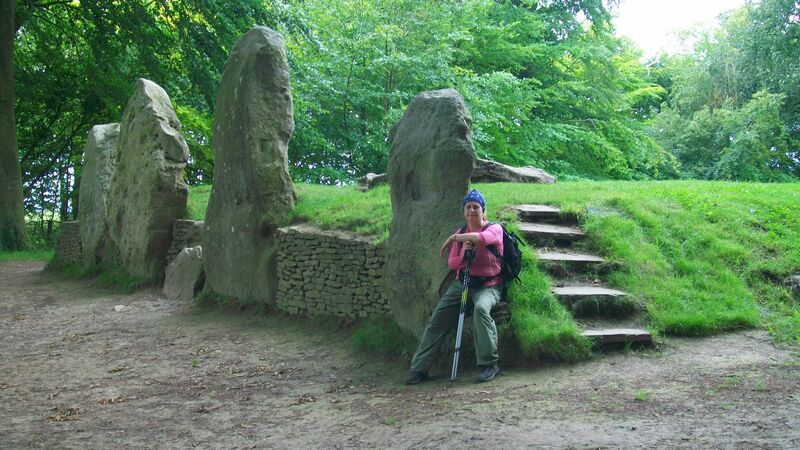 Hiking Adventures, The Ridgeway, U.K.
Travel tales and everyday life from our many homes in Jamaica, Nepal, Philippines, UK, US and Greece. The views and opinions expressed in this blog represent those of the author, and not of the United States Government or any of its agencies or officials therein. All information disclosed in this blog is non-sensitive and readily available in the public domain. Hot as in too hot. All the time!